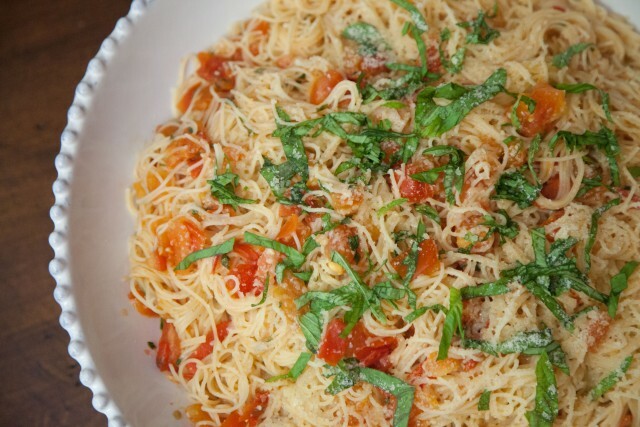 My favorite spaghetti dish ever! In a large saucepan, heat 3 Tbsp. olive oil over medium- high heat; add minced garlic. Saute about 30 seconds, careful not to burn it. Add the chopped tomatoes and cook over high heat for about 10 minutes. Turn the heat down to medium and continue to cook for 5 additional minutes; add the chopped basil and 2 tsp. of salt and some pepper. Cook until the tomatoes are soft and they lose their firmness and shape; Stir frequently. If the tomatoes are done before the spaghetti, turn burners to simmer to keep the tomato mixture warm until the spaghetti is done. While the tomatoes are cooking, add water to a large pot and bring to a boil. After the water comes to a boil, add salt and pasta. Boil for 9 minutes. Drain and add to the tomato mixture; add 1 Tbsp. olive oil over the pasta. Toss well and transfer to a serving bowl. Garnish generously with grated Parmigiano Reggiano.